Today is my boyfriend's 25th birthday (please no cougar jokes!)! Matthew is not really a party person, in fact we both are not, we like small groups of friends in the backyard and we are homebodies to a certain degree. We had people over for drinks and cake. I made a chocolate - almond cake with classic vanillia frosting. 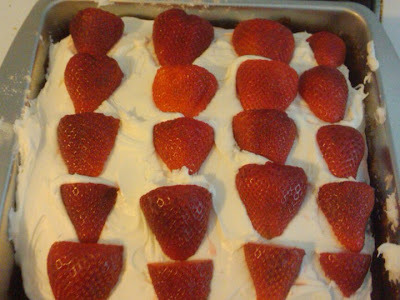 I was so rushed that day I had no time to make a from scratch frosting so I took a tip from Sandra Lee and did a semi home made trick of jazzing up anything store bought by making it pretty. In this case tons of fresh organic strawberries! I just bought a vegan vanilla frosting to slap on my from scratch cake and it was great! I made two of these cakes for the mini party and they were gone by the end of the night! Also during the mini party Matthew debuted the newest music video he directed. I got a credit of course! Please check it out! Happy birthday again Matthew with lots of love!